This is sure to be a one of a kind tennis and swim experience. 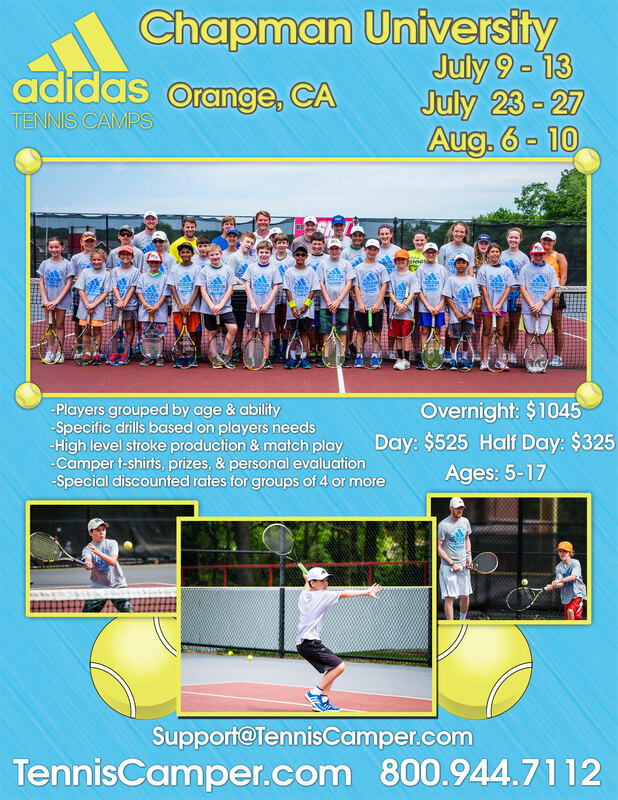 The adidas Tennis and Swim Camp at Chapman University is directed by head tennis coach Will Marino and aquatics director Eric Ploessel. Campers will choose from participating in either tennis or swimming drills, games, and matchplay, or both. Overnight campers will check in July 23 between 8:00-9:00am at the dorm (TBA). Check out on Friday at 4pm at the courts. Day Campers will check-in daily between 8:30 – 9:00am. Please arrive at 9:00am dressed and ready to play. Check-out each day at 4pm. Campers are required to bring their own lunch for the first and third sessions. Half Day Campers will check-in between 8:30 – 9:00am on Monday. For the rest of the week, please arrive at 9:00am dressed and ready to play. Check-out each day at 12pm. Lunch is not included. The nearest airport is John Wayne Airport in Santa Ana, CA. You are responsible for getting yourself to and from campus, adidas Tennis Camps does not provide transportation. 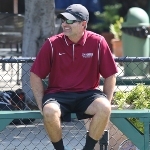 Will Marino- Head Tennis Coach for Men and Women at Chapman for 18 years. Both the Men and Women’s programs have been ranked in the Top 25 in the Nation for the last 10 years. Will has develop 7 All Americans for the Men and 10 for the women. In 2010 Will was named ITA college coach of the year. Will has been teaching tennis for Juniors and Adults of all levels for over 25 years. Will came to Chapman in 1999 from the U.C. Irvine women’s program, where he was an assistant coach for three years. He became most familiar with Chapman as an opponent of the Panthers from 1989-90 while playing singles and doubles for Cal State Bakersfield. While at CSUB, Will was a two-time All-American in doubles, ranking as high as 25th in the nation in 1990. The son of long-time aquatics director Dennis Ploessel, Eric became Chapman’s head women’s water polo coach in spring 2004 and helped guide the Panthers to their first top-10 national ranking in school history with a 17-13 record. In 2005, Chapman ranked as high as No. 3 in the nation and qualified for the Collegiate III Championhips for the first time ever and finished fourth in the tournament. Ploessel’s athletes have also excelled outside of the water as Chapman ranked No. 5 in the nation in team GPA in 2006 with a 3.33 mark. Prior to becoming head coach of the women, Eric served as men’s and women’s assistant coach for three seasons. He still serves as an assistant on the men’s and women’s swimming teams. Eric played collegiately at Long Beach State from 1995-98, scoring 58 career points, including a career-high 20 as a senior. He once notched five goals in an overtime win versus U.C. San Diego.